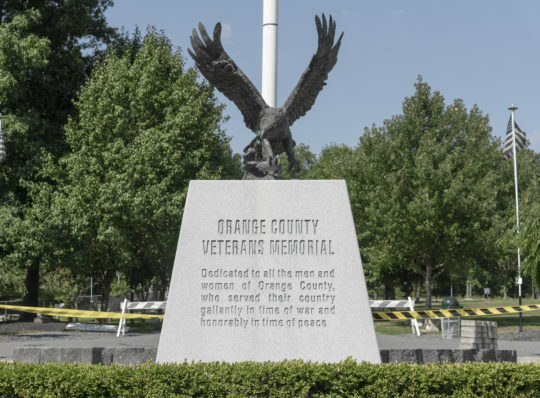 Orange County Veterans Cemetery – KC Engineering and Land Surveying, P.C. KC developed a master plan for the Orange County Veterans Memorial Cemetery as well as provided architectural design and engineering for pavilions, lighting, landscaping, and a plot locator. KC analyzed the layout of the site and developed a master plan that included site topography, roadway configuration, access and internal circulation, signage for both vehicles and pedestrians, landscaping and lighting, water, sewer, irrigation, drainage facilities, and an evaluation of the existing structures and facilities. Several draft plan approaches were presented to the Veterans Affairs Board for discussion. A single plan, including elements from multiple plans, was fully developed into the master plan document for the facility. The remaining term of the agreement was used to help the County design and implement additional facilities within the cemetery. Some potential new facilities included a second dedication area, a directory kiosk, and a new columbarium. KC prepared full design and bid / specification packages for these projects.